Some tropical crops, such as cassava, contain cyanogenic glycosides, toxic substances that release hydrocyanic acid (HCN; also referred to as cyanide or prussic acid) when cells are crushed. Consuming these plants without cooking them can cause cyanide poisoning, with varying effects depending on cyanide levels and how long a person or animal has been eating that plant. Chaya (Cnidoscolus aconitifolius) leaves also contain cyanogenic glycosides, which is why we recommend cooking them (to boil off the HCN) before eating. To determine if a plant is safe to consume, a simple cyanide screening test using Cyantesmo paper is very helpful. Cyantesmo paper can be cut into short strips, placed in a sealed bag or container along with plant material being tested, and used to detect the presence of HCN. If the paper turns blue, HCN is present. It does not indicate parts per million; however, smaller concentrations of HCN will result in a lighter shade of blue than higher concentrations. See EDN 130 for more information on how to use Cyantesmo paper. In September of 2015 we found that it took between 15 and 20 minutes of boiling time to no longer detect HCN in chaya leaves. Since that time, we were asked if HCN is present in the petioles and green stems, as apparently these parts of the plant are consumed in parts of Asia. To find out, we repeated the trial in February 2017. 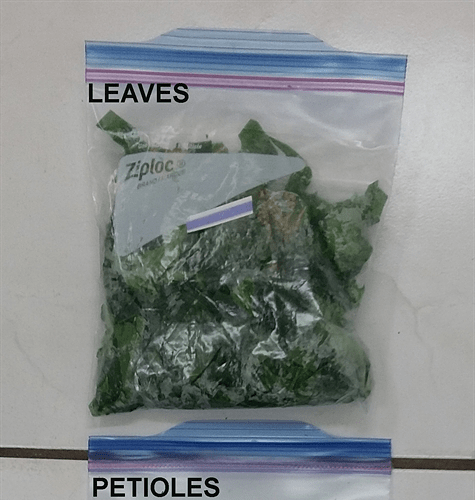 Sixty grams each, of fresh chaya leaves, leaf petioles and green stems, were chopped up and placed in quart-sized Ziploc® bags. With raw, uncooked material, HCN was detected in leaves and petioles but not the green stems (see photos below). This was with readings taken 20 minutes after placing cyantesmo paper in the Ziploc® bags with the chaya plant tissue. No HCN was detected—for leaves, petioles, and stems—20 minutes after boiling. In a subsequent replication, however, HCN was detected the following day, after boiling leaves, petioles and stems. As in Sept 2015, it took between 15 and 20 minutes of boiling before HCN was no longer detected. 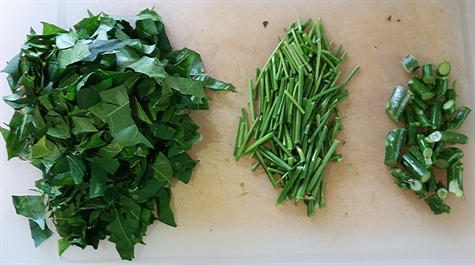 Results suggest that leaves, petioles and green stems should all be boiled to remove HCN.